Jessica graduated from Texas A&M University in College Station, with a B.S. in Wildlife Science, and a specialization in Conservation Biology and Biodiversity. She was raised in Corpus Christi, Texas, and has traveled many of the United States, South Africa, India, Germany, Spain, and Belize. Over the years, Jessica’s career has taken her from working at sanctuaries with exotic felines and raptors, to creating public programs as an environmental educator at nature centers and camps. She has experience in rehabilitating, maintaining, training, and free-flying birds at various centers, including the World Bird Sanctuary. 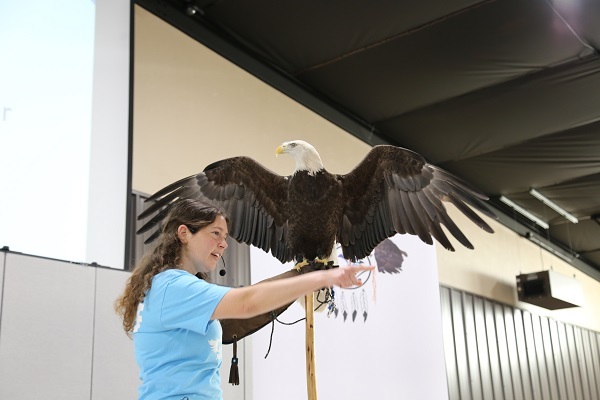 Jessica has earned certifications as a Professional Bird Trainer (CPBT-KA), and an Interpretive Guide (CIG), and is a member of the National Association for Interpretation, and the International Association of Avian Trainers and Educators. Ultimately, Jessica loves sharing her passion for wildlife with others, and enjoys being a part of the team at the Grey Snow Eagle House!